Amazon and Wex have slashed the cost of the popular Manfrotto Carbon Fibre Tripod (MT190CXPRO4) by almost 50% in this fantastic Black Friday deal. Right now, you can pick up the extremely lightweight tripod for just $259.88 (reduced from $478) from Amazon – or £269 (reduced from £394.95) from Wex. That’s an absolute bargain. 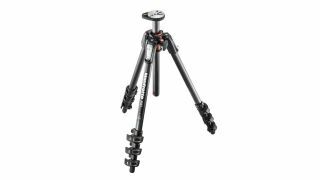 At 1.65kg, the Manfrotto 190CXPRO4 is a lightweight four-section carbon fibre tripod that’s well-suited for travel. With a 90° centre column mechanism, the column can be extended vertically, as normal, as well as horizontally – making it extremely versatile, and ideal for wide range of photos and video uses. In the States, Manfrotto itself has cut the price of the 190CXPRO4 for Black Friday, too: you can buy the tripod directly from the company for $328.99. But these offers from Amazon and Wex beat Manfrotto's discount. They're by far the biggest savings on the superb Manfrotto 190CXPRO4 you’ll find anywhere right now, so we don't expect stock to last. Aside from the 90° centre column mechanism and extremely light weight, key features of the Manfrotto 190CXPRO4 carbon-fibre tripod include its four-section legs, which make it extremely compact, and Quick Power Lock levers, which enable each leg of the tripod to be released in a single movement. If you choose carbon fibre over aluminium, you’ll feel the difference if you have to carry your tripod for any length of time: the lighter weight is noticeable. Another benefit of carbon fibre is reduced vibration, too. Overall, the Manfrotto 190CXPRO4 is excellent value for money on any day of the week – but with this excellent Black Friday deal, it’s a steal.